Syphon VDMX 5 Beta 8 integration Demo from vade on Vimeo. Once upon a time, we imagined a future in which computer applications shared content, media, and data effortlessly, where different tools all coexisted. The reality we got was, in almost every category, far more monolithic. By exploiting a little-known feature of the Mac’s graphics implementation, Syphon, an open source development tool, seeks to create an ecosystem in which creative Mac graphics apps can share graphics, video, and textures. It’s real-time, GPU-accelerated, obscenely fast, and it already supports a variety of software, with more coming quickly – thank simple, straightforward developer tools. But now it’s here, in a public beta – and we have a variety of projects to show off just what it’s for. It’s really better to see than talk about. 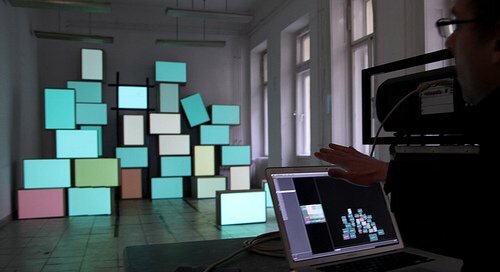 Once you see it, though, you see new possibilities for workflows in live visuals on the Mac. What do I mean, exactly? Check out the demo with VDMX 5 at the top. And VDMX is only the beginning. Already, we are seeing and hearing about Syphon support in fun projects. Within 24 hours of our first private beta at the end of August, we were sent development builds of applications with Syphon support. We’re looking forward to some of those appearing over the coming weeks. Vidvox have added Syphon into the next major update to VDMX 5. (see video, top) We’ve been playing with development builds and the integration is really neat – you can use video coming in via Syphon to be triggered or routed through effects just like you currently use clips, and you can send video out via Syphon not just for the final output, but from any layer, group or plugin. 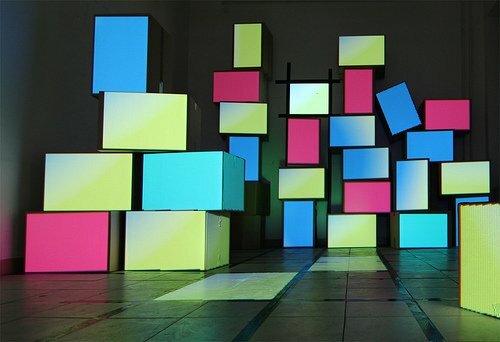 One of the most exciting things we’ve seen is MadMapper, which is a real-time projection mapping tool currently being developed by the garagecube team [artists, makers of Modul8] and 1024 architecture [“visual label”]. It takes its input from Syphon, so you will be able to do really complex projection mapping from any Syphon-supporting application. That sort of highly-specialised app, and its ability to tie into your VJ or content creation tool of choice, is one of the most interesting directions I see Syphon going. We’ve aimed for a super-easy API, and while we are releasing a bunch of plugins today (for Max/MSP and Jitter, Quartz Composer, FreeFrame GL and Unity3D), the real opportunity is in what other developers are going to do with the Syphon framework. We think we’re on our way to having a really robust framework that will slot into any environment with minimal coding. Not only do we hope people will step up to make plugins and extensions to the popular environments we’ve missed (OpenFrameworks and Processing are two of the big ones), but if there’s any part of real-time video creation, manipulation or display that someone wants to customize, they can use Syphon to get frames in or out and concentrate on a custom application that needn’t fit in to any existing environment at all. People have been asking what’s required to use Syphon: beyond an application that supports it, the only requirement is MacOS 10.6. I have an old Macbook with an Intel GMA 950 and I can push frames around that at 60 FPS. The two biggest requests we’ve heard are for support for other platforms, and for networked video-sharing. We’re both Mac programmers, and we know that the core technology behind Syphon (the ability to share GPU resources between applications) is specific to Mac OS X. It would be great if someone came to us with a solution for other platforms, but it’s not something either of us are in a position to do ourselves. Ed. : Hint, hint – if you DO know how to do this, do get in touch, even if just to say what’s required. -PK As for networked video sharing – there are already ways to get video between machines, so it’s not a priority – but hey, it’s open source, so if anyone has strong feelings on these they can come along and work on them. We had really useful feedback (and a couple of donations, those help too) from our private beta testers. Since our private betas we’ve got rid of some bugs, improved performance and changed the license to BSD. The question we’ve been asked most of all is “when?” Finally, the answer is now. Syphon Teaser from vade on Vimeo. Live Stream of Avid Press Conference; Pro Tools News, Anyone?